Slowly but surely I am changing from Ruth v. Zimmermann into Ruth Rozelaar. I like ‘Rozelaar’ – it is a dutch word for someone who grows Roses. So I have changed from being a carpenter to someone who grows roses. However, it’s not exactly going to be easier for English people; I think I will continue having to spell my name. One thing I am looking forward to is losing the ‘von’ in my name, as it has persistently caused havoc with official documents in England. So, I’m at the bank, changing my name. Three days later the new cards arrive – in the name of Ruth von Rozelaar! After a teaching session in Bristol, we sit in the pub with our group of Tango students. In conversation, we tell them about our journey plans and show them photos of our motor home. “Do you have a name for it yet?” asks one woman. “Well, you should give it a name, like Henry, or Rosy or something”, she says. Henry or Rosie! Henry is the name of my ex, and Rosy the name of Frank’s. How freaky is that? I think we will politely decline these suggestions and wait for a more apt name to turn up. Our number plate has the letters E, K,N & O in it. Any suggestions for names? Think about how much you’d be willing to spend on a project of your dreams, and then double it. That counts for money as well as time allocated for it. Our vehicle is coming along. 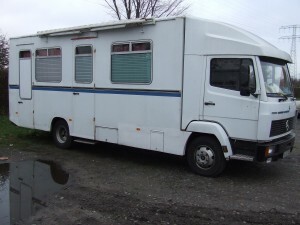 We call it our Honeymoon Suite, since we can’t get used to calling it a lorry. 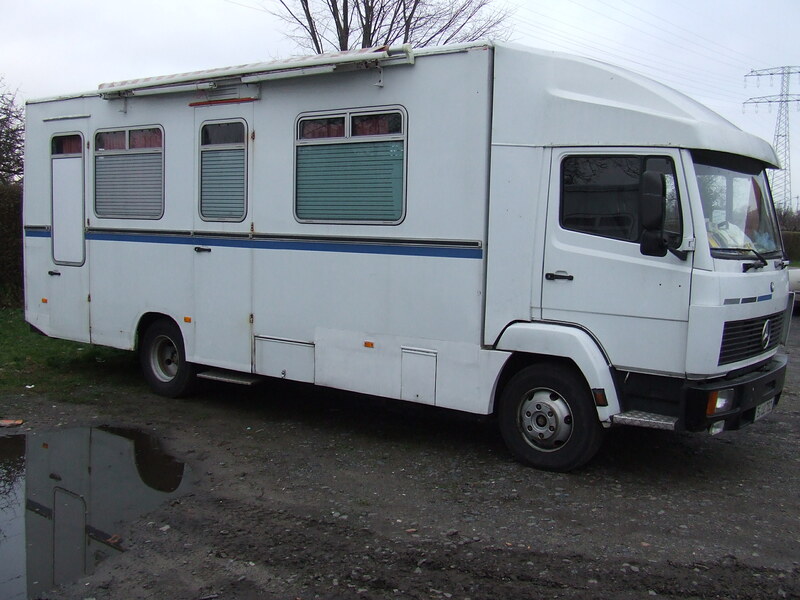 One big relief is that we seem to have found an insurance broker who is going to insure an old 7.5 ton vehicle of over 8mtr length, not factory converted, with a left hand drive, for a lengthy period abroad. All of these factors were deterrents with most insurances, but we got there in the end. Now we are fighting with the DVLA. Nothing out of the ordinary, just trying to obtain the right forms is hard enough, as they have no more offices in the country. The other battlefront is getting my name changed, so that by the time we leave we have all documents in the new names. Passports, driving licences, vehicle documents, bank accounts etc. etc. According to English law, I can use Rozelaar and von Zimmermann in any way I like. I could have a bank account in one name, my bills in another. According to German law, I have to apply for the name change: Fixing a date one month in advance, Frank and I had to appear before the embassy in London with at least 6 documents in triplicate. Now it will take about 6-12 weeks to process my application after which I will get a piece of paper that will allow me to apply for a passport in my new name. One would have thought that in this day and age of technology these things go quicker. But no, everything has to be sent by snail mail to Berlin and back. 3rd Where does the journey start? About 20 years ago, when I was pregnant with my second daughter, I promised myself that when both my daughters leave home, I will go on a long journey. Some things take a long time to come to fruition. Twenty years and two amazing, grown-up daughters later, the time has come: this September, I will take wing and leave my home town for an indefinite amount of months to travel around Europe. What I didn’t know 20 years ago is that I would find the love of my life, and we would celebrate our wedding the weekend before we start the journey, thus turning it into a honeymoon. Neither did I know that I would be a Tango teacher. My last big trip was about 15 years ago. I had forgotten just how hard it is to prepare for a long trip, how much there is to do. The image of a swan comes to my mind, trying to lift itself out of the water, flap-flapping wings beating the surface for a long time before it finally is airborne. My flat and Frank’s house will be rented out (my flat is already spoken for, but anyone wanting to rent Frank’s house in Cardiff for 6months plus, give us a shout), and we will live and travel in what we fondly call ‘Our Honeymoon Suite’ – here is a picture. I won’t give you any inside pictures, it’s a mess at at the moment; we are at the height of ripping everything out before putting in what we want.